The use of black and white in decorating can create stunning and dramatic decor. Find out how to best take advantage of the combination of these two simple colors to maximize your decorating statement. There's a rule in decorating that says that "every room can use a touch of black." You might think this is strange if you have a room of pastels or jewel tones. But think a minute. Using the color black adds a focal point of color that grounds, anchors, and adds a sophisticated look to a room. The use of black and white in decorating gives a fresh, clean, unquestionably sophisticated and elegant look to any room. Black and white are a perfect color combination for any decorating style. Contemporary interiors often combine black and white with sleek metals. French Country decorating style, among many others, is often set off with this color combination. If you're afraid of using just black and white, add variety by adding areas of yellow, pink, camel, red, or purple for a striking look. Keeping black and white prominent, however, preserves the elegant effect. A black and white floor is a good place to start decorating with black and white. The ultimate choice would be beautiful black marble set off with tall white baseboard moldings. Short of that, try white ceramic tiles with a black border, vinyl tiles laid in alternating black and white squares, or a painted black floor with white border stencils or white with black stencils. Walls painted stark white or a soft, ivory white serve as a perfect background for framed photographs, prints, and other artwork. Choose dark wood or painted black frames. Select stark black and white matting for your artwork or add a punch of color with red, gold, or black mats. Contemporary homes incorporate black and white in wonderful ways. Use dark, charcoal rugs or carpeting. Don't feel obligated to paint all the walls the same. Choose vibrant accent colors for a focal point. Add colorful artwork, shiny or matte finish metal accents, and modern designed fabrics. Even cottage style interiors can use a black and white color scheme. Pair black and white toile fabric with gingham checks on chair covers, tablecloths, and pillows. 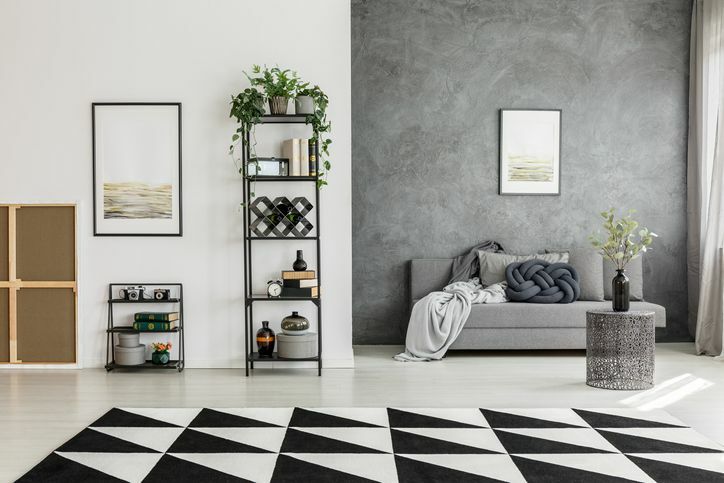 Hang a collection of black metal trays on a dining room wall, cut black and white checks for picture matting, and use black and white ticking stripes for a bed skirt. Accent pieces of black iron are very popular and easy to find. Use a black metal table base with a glass top and black iron candlesticks and light fixtures in a dining room as well as black iron bookends in the family room or home office. To create a striking table setting, look for black and white china. All white or all black works well. Choose plain white china for greatest versatility. Add table linens and accessory pieces in black or any accent color. Add drama and sophistication to any room in your house. Use black and white alone or with other accent colors to create a style that's classic and simple.